Part of an animal Christmas card design collection. 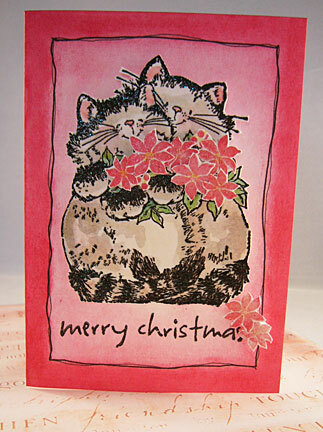 Cat Christmas cards are great Christmas greeting cards to send to those who love cats. Are cat lovers insane? No! They are just insanely in love with cats and will go all out to look after every stray cats. My downstair neighbour, Tianli, is one. The last time I counted she had fourteen cats. She kept them in the apartment with wire meshed windows so that they don't run out and get hurt. She has a personal vet who looks after the cats medical welfare. To transport her beloved cats, she engaged a pet transport company who comes to her house with cages to help send them for regular pet medical check ups. So with her as my friend and neighbour, I thought I will make her and her family a cute Christmas card with cat images. Have a Very Kitty Christmas Day! This Merry Christmas card with the two cats are so adorable and I'm sure my friend will treasure it. The cat rubber stamp is one from the Margaret Sherry Collection by Penny Black, Inc. Actually, on the wood mounted rubber stamp, the cats were holding a bouquet of roses. But to make a kitty Christmas Card, I stamped some poinsettias from another rubber stamp and covered the roses with them. The 'merry christmas' rubber stamp is from Hero Arts. It's in one of their Christmas theme clear stamp sets. I stamped both the rubber stamped images with black pigment ink and embossed with clear embossing powder. Color with water color. It's easy with wood mounted stamp especially when the colored image is on the top of the wood. So just follow the example and color with color pencils or watercolor. Stamped the poinsettias with red pigment ink and heat embossed with clear embossing powder. Trim and mount with double sided foam tape on to the cats arms covering the roses. I used my usual white cardstock. Draw a frame with my Pigma Micron 005 pen and color with red watercolor. Finally, I used double-sided foam tape to mount the cats onto the center of the card front. That's it. One of my Cat Christmas cards is done. For other cat Christmas cards, you can use any kitty rubber stamps with kittens playing with a ball of thread or doing other cute activities. Now my cat Christmas greeting card is all ready for hand delivery. Add a Christmas quote or Christmas card verse inside the card.